The MMMM #20 had a pretty cool figure. I do like the Robin Mask figure. Is it bad that my own bad joke was my favorite part – looking back five years later? Good god. I’m embarrassed to admit that. The Trying New Things post is pretty boring, but I’m glad I did those things. I really crow-barred that XFL reference into the post. I still luck the Predator/Duck Hunt gif. It is disappointing that some Class A auctions did not get highlighted that week. They showed up in the Epilogue, but we can only see the prices today. Without the pictures – who cares? Do you know what is strangely frustrating? Those dead picture links. I’ve never been able to figure out what was there. I can’t remember and I cant track it down. That’s why I always try to host the gifs and pictures today. Finally there was the MMMM #21. I think that was the first time the large title and author was used. And how much has Professor Terry life change in five years?!?! In the post he mentioned his honeymoon last October. Very recently his little one helped write MMM #129. That’s pretty awesome to see. 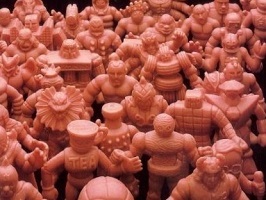 Maybe Dr. M.U.S.C.L.E. and Ms. Terry will keep the hobby going in the future? 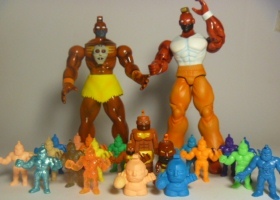 Maybe they’ll just get married and create a 3rd generation of M.U.S.C.L.E. fans. That’s probably even less likely. This entry was posted on Saturday, September 29th, 2018 and is filed under UofM News. You can follow any responses to this entry through RSS 2.0. You can skip to the end and leave a response. Pinging is currently not allowed.